The perfect gift for garden lovers! The President of the North of England Horticultural Society has pleasure in inviting you to experience a very special day out at the 2019 Harrogate Spring Flower Show. The President’s Pavilion is now open to welcome guests enjoying our VIP hospitality. Traditionally the exclusive domain of the President and their personal guests, the elegant pavilion has been relocated to overlook the beautiful spring show gardens and extended to include a comfortable lounge and outdoor terrace. VIP guests can escape the hustle and bustle of the show to relax and enjoy delicious fine dining and refreshments throughout the day, with a warm welcome to the show, dedicated on-site parking and private facilities at their disposal. Priced at just *£109.95, your VIP experience will include morning coffee with biscuits or pastries, a personal introduction to show highlights from a member of the team, and Bucks Fizz reception followed by a delicious five course lunch of seasonal, Yorkshire produce with wine. Afternoon refreshments, show ticket, complimentary programme and VIP parking are all included too! Sample menus are available below. 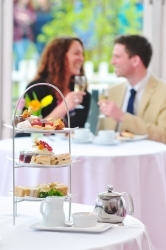 The President’s Pavilion is the perfect place to celebrate a special occasion or join friends for a fantastic day out. We have a fantastic range of options, so why not treat someone special to a gift they will treasure? 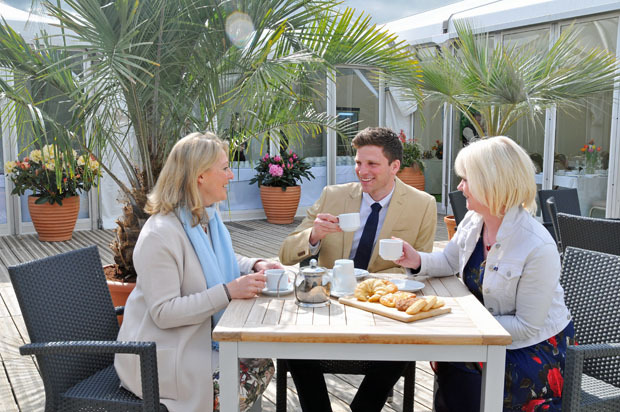 Celebrate the start of your day with a glass of Bucks Fizz or morning coffee and selection of delicious pastries, served in our VIP marquee between 9.30am and 11am. You will also have a special introduction to the highlights of the event. *£39.95 per person. A lovely way to finish the day with a selection of tasty finger sandwiches, assorted cakes, scones with cream and preserves, tea or coffee. Make the afternoon really sparkle with a glass of champagne! From *£49.95 per person. Enjoy a super Sunday at the show with a Bucks Fizz reception followed by a delicious five course lunch and wine. *£69.95 per person, including use of the marquee until 4.30pm. Menu samples are available below. All of our President's Pavilion packages include your show ticket, programme and preferential parking. Availability is limited, so be sure to book early to avoid disappointment - call us on 01423 546157. Please note: due to the Good Friday Bank Holiday we are only able to take bookings until 12 noon on Thursday 18 April 2019. Guests in the President's Pavilion must be aged 16 or over. *A £1 administration fee applies per order. My wife and I and two close friends took advantage of the VIP Day at Harrogate Spring Flower Show. We had such an enjoyable day that I felt I must write and congratulate you and your team. Loved my visit to the Spring Flower Show - each year seems to get better. The outside garden dislays were great and gave us lots of ideas. The quality of plants was fantastic and the arrangements quite beautiful. Can I please say a huge thank you to all your staff. It was a lovely day and I am sure some of our 'first-timers' will be back next year.